Noynoy Aquino appears to be the type that can focus only on one problem, or thing, and whatever he is focused on takes up all his concentration, to the detriment of other problems. This probably explains his latest remark to reporters such as saying that finding the fugitive Sen. Panfilo Lacson is not his priority. The typhoon damage, he claimed, is his priority. “My priority are the problems we have today that have created damage to the Philippines, whether it is a natural disaster, crime incidents such as kidnapping,” he was quoted in reports as saying. “Shall I drop all my concentration here and attend to Senator Lacson? I don’t think you’d argue with that,” Aquino retorted. There he goes again, absolving his faves in his administration. Reacting to the press report that Ed Angara wants the Malacañang-created truth body to also probe the PEACe Bonds scam, where Dinky Soliman and Teresita Deles have been alleged to have been involved, Noynoy, through his spokesmen, said it up to the Truth Commission to consider Angara’s proposal. Then they added: No evidence can pin Dinky and Deles on this issue because Dinky has not participated in such anomaly. So why is Malacañang — and Noynoy too — quickly absolving Dinky and presumably, Deles? No investigation has ever been made on the P10-billion PEACe Bond scam yet the Palace quickly absolves Dinky and the rest of her NGO group? The truth body is not a creation of Congress, but of Noynoy. It is therefore not an independent body, and can never expect to be one, as it has to toe Malacañang’s line. WASHINGTON — Barack Obama, the unifying inspirational figure of 2008, has become, in 2010, an enthusiastic partisan warrior, lacerating Republicans as a new reckoning looms with angry voters. President Obama’s toughened rhetoric reflects a transformed political environment since his historic election win two years ago, with a sour Washington era in prospect as Republicans expect a big win in midterm polls. In 2008, Obama billed himself as the personification of hope and promised to soothe the ugly divides in Washington. “The American people don’t want to hear politicians attack each other,” Obama told a crowd in St Louis on Oct. 18, 2008, two weeks before he was elected president. “You want to hear about how we’re going to attack the challenges facing middle class families each and every day,” Obama said. Back then, Obama repeatedly stressed the need to renew the faith of an electorate steeped in cynicism about politics. “We have always been at our best when we’ve had leadership that called us to look past our differences and come together as one nation, as one people,” Obama said in South Carolina on Oct. 19, 2008, calling for a new politics. But in 2010, two weeks before congressional elections, it is a caustic Obama who is doing the attacking. “Who would continue their tasks? The dead could no longer speak. 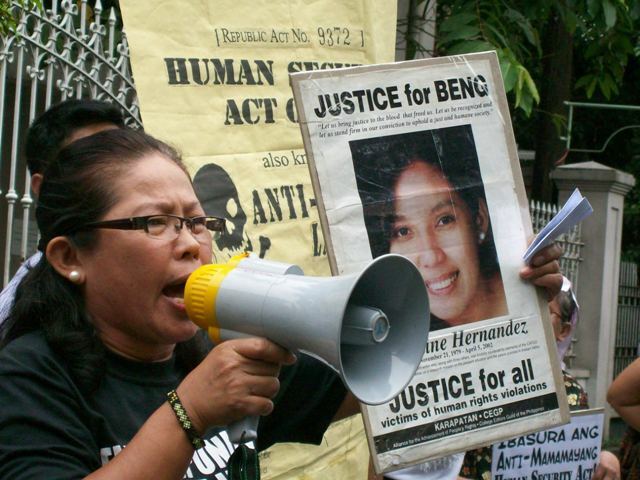 It is us, the ones they left behind, who must carry on what they had started,” said Evangeline Hernandez, mother of slain human rights defender Benjaline “Beng” Hernandez and chairwoman of Hustisya! MANILA – After a loved one became a victim of extrajudicial killing, how does one go on with life? For Evangeline Hernandez, losing a daughter has led her to a meaningful cause. For Ernan Baldomero, the death of his father became a wakeup call. Nanay Evan, as what her colleagues call her, 50, is the mother of Benjaline “Beng” Hernandez who was killed along with three others in Arakan Valley, North Cotabato on April 5, 2002. Beng was then deputy secretary general of Karapatan-Southern Mindanao Region and vice president for Mindanao of the College Editors Guild of the Philippines (CEGP). In a recent decision, the United Nations Human Rights Council (UNHRC) held the Philippine government accountable for her death. Ernan, meanwhile, is the second of the five children of Fernando Baldomero. Fernando, municipal councilor of Lezo, Aklan and provincial chairman of Bayan Muna, was gunned down on July 5 in front of his residence in Kalibo, Aklan. Nanay Evan and Ernan met at the first national assembly of Hustisya! (United for Justice), an organization of relatives of victims of extrajudicial killings. “I had hoped that my father’s case would be the first and the last case of extrajudicial killing but the culture of impunity is still here. There has been no effort from the President to stop the killings. His inaction has allowed the killings to go on,” Ernan, son of Fernando Baldomero, first victim of extrajudicial killing under the Aquino government, said. MANILA – Ernan, second of the five children of Fernando Baldomero, was monitoring the radio that morning of July 5. Although he knew his father was a target of the military, hearing the news about his father being shot at by gunmen still shocked him. Fernando, a municipal councilor of Lezo and provincial chairperson of Bayan Muna, was shot dead in front of his house in Estancia, Kalibo while preparing to bring his son Karl Philip to school. “My father and brother were riding on a motorcycle when the gunman went near them and shot my father on his left shoulder, then on his chin,” Ernan told Bulatlat. He was pronounced dead on arrival at the hospital. Karl Philip, 12, was unhurt but traumatized. The results of two environmental investigative missions belie the declaration of President Benigno S. Aquino III that local communities would decide whether to allow mining operations in their area or not. In South Cotabato, Aquino was reported to have mediated to reverse the decision of the local government disallowing mining in their jurisdiction. MANILA — Contrary to President Benigno S. Aquino III’s 100th day report, mining projects have been supported and allowed by the national government despite the strong opposition from communities. Aquino earlier said local communities will decide if they will allow mining projects in their area but results of the two environmental missions led by Kalikasan People’s Network for the Environment (Kalikasan-PNE) revealed otherwise. The first environmental investigative mission was held Aug. 26 to 28 in Davao Del Sur and Sultan Kudarat, site of the Tampakan Copper-Gold Project. Australian based mining firm Xtrata-Sagittarius Mines Inc. (SMI) owns 62 percent of the project. The second mission was held Sept. 10 to 12 in Cagayan province where various small mining companies are operating in different areas. The results of the two missions were presented in a press conference Oct. 11. “Results of our investigations show those foreign mining corporations and their local partners either deceived or forced the people to accept their mining projects,” Clemente Bautista Jr. of the Kalikasan PNE said. No change is forthcoming in the case of the new administration’s appointments of ambassadors plucked from the circle of retired military officers. President Aquino’s appointment of retired military generals as ambassadors only continues a practice of his unpopular predecessor that was widely criticized by the political opposition then — now making up the new administration — disgruntled career diplomats of the Department of Foreign Affairs (DFA) said yesterday. Aquino has appointed former Armed Forces Chief of Staff Nestor Ochoa as envoy to Brunei and re-appointed retired Gen. Noe Wong as ambassador to Cambodia. Ochoa succeeded Lt. Gen. Delfin Bangit, who retired a year early on June 22, 2010 after then President-elect Aquino said he would replace Bangit. Talk then was that Aquino had that early offered an ambassadorship to Ochoa to enable him to appoint his choice for AFP chief of staff. With President Aquino making it clear that finding fugitive Sen. Panfilo “Ping” Lacson is not his priority, his Justice Secretary Leila de Lima appears to have lost interest in getting a special task force to hunt down Lacson, who went to ground just before a warrant for his arrest for the double murder case of publicist Salvador “Bubby” Dacer and his driver Emanuel Corbito was ordered and he has evaded the long arm of the law for almost a year now. De Lima scrapped the idea of forming a special task force to hunt Lacson but appears amenable to the idea of giving a cash reward to any informant who can give any information that would lead to the arrest of the fugitive lawmaker. as kidnapping,” he was quoted in reports as saying. ZAMBOANGA — An ex-convict burst into a school in the southern Philippines and stabbed three people to death before being killed himself yesterday, a police official said. The knife-wielding man killed a teacher, a 12-year-old schoolgirl and an elderly man and wounded at least six other persons in a school just outside the southern city of Zamboanga, said Senior Supt. Edwin de Ocampo. “The suspect reportedly went inside the classroom, then stabbed the teacher in the chest, then stabbed two other teachers and two students,” De Ocampo, the city police director, told reporters. He then tried to enter other classrooms, stabbing more people along the way, De Ocampo said. The female teacher and one of her students were killed, along with the girl’s grandfather who was visiting at the time. Two other teachers and four more students were also wounded in the attack, De Ocampo added. The death toll from super typhoon “Juan,” which roared across the country earlier this week, rose to 36 yesterday, authorities said. The typhoon slammed into the northern part of Luzon last Monday, ripping roofs off houses, toppling power lines and nearly destroying some coastal villages. With wind gusts of 260 kilometers per hour, it was the strongest typhoon recorded anywhere in the world this year. Data from the Red Cross showed 36 persons had been confirmed killed, mostly in the north of Luzon, up from a toll of 27 on Thursday, while the Camp Aguinaldo-based National Disaster Risk Reduction and Management Council (NDRRMC) said there were 26. 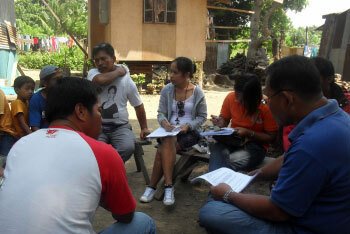 The NDRRMC added that injured persons also increased to 34. Malacañang yesterday said it will abide by the recent Supreme Court decision lifting the temporary restraining order (TRO) it had previously issued against the planned 250-percent toll rate increase by the Toll Regulatory Board (TRB) in South Luzon Expressway (Slex). Presidential spokesman Edwin Lacierda advised citizens to “wait and see” for the time being since the option to file a motion for reconsideration remains open for the complaining parties and the TRB is yet to determine toll rate increases following the high court ruling. He added he will immediately confer with Transportation Secretary Jose de Jesus on the repercussions of the SC decision including the date of the effectivity of the adjusted toll rates. “We would like to (make an) appeal to the public… Let us not feel so agitated (because of this development). I know that the concerns are there. I know that we have fears on the possible domino effect (to other industries once the 250-percent toll hike in Slex is implemented). But consider what happened to Nlex (North Luzon Expressway). There has been a huge improvement there and over time, people realize its benefits — people were willing to accept it,” Lacierda explained at a news conference addressing the complaining parties. Department of Justice (DoJ) Secretary Leila de Lima yesterday said she had already reviewed the case of the so-called “Morong 43” but added that she needed the approval of President Aquino before implementing any of her recommendations. De Lima made this statement shortly after meeting with family members and supporters of the group, which includes Karapatan acting secretary general Jigs Clamor. Clamor and other family members of the group visited the DoJ chief in an effort to expedite the release of their loved ones who are presently detained in Camp Bagong Diwa, Taguig. He thanked De Lima for initiating to review the case of the detained health workers and hopes that government prosecutors will withdraw the charges of illegal possession of firearms and explosives filed against the “Morong 43”, including his wife, Dr. Merry Clamor.